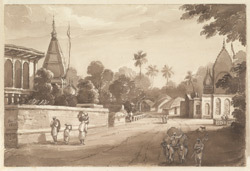 Sepia wash drawing by Harriot Mary Woodcock, of a road lined with thatched houses and temples, dated 1831. Inscribed on reverse: 'Part of Mozufferpore Tirhoot. Decbr. 1831' and on mount: 'H.M. Woodcock. Mozufferpoor'. The city of Muzaffarpur, situated in north-central Bihar, was founded by Muzaffar Khan in the18th century. It is an important trade centre on the Patna-Nepal route. The scene depicted by the artist shows a scene in a village nearby.